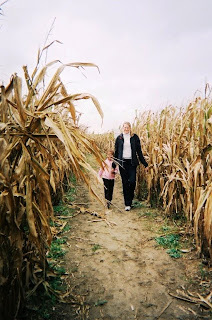 In addition to the Pumpkin Patch we visited at the McLeod Farms, we also took a stroll through the Corn Maze. 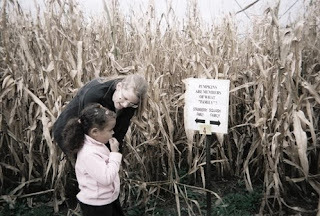 Eva and I have never been in a corn maze before and I'm not sure if Patti has either. We didn't think it'd be difficult and didn't allow much time to do it. I told Eva she could choose which way we went at each turn and I thought we'd find our way out in about fifteen minutes. When they handed me a map, I didn't really think I'd use it. And here I am using it twenty minutes later with Eva asking, "Why did we come in here?" When they said they used CAD (computer aided design mostly used by engineers) and GPS on the tractors to build the maze, I probably should have taken pause. "In case this is too easy for you," they said, "we have a more difficult alternative." You can enter through the exit and follow difficult signs with difficult questions written backwards or in some other language and with difficult answers. We took so long the girls had to stop for some nourishment along the way. I want so bad to take my youth group back and to take Tommy and Eden back, but I think the maze is only open through October 31. Well, well worth the trip out there. 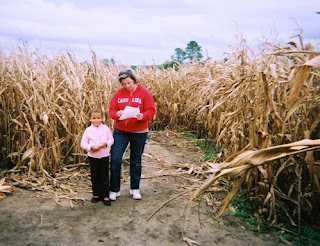 It sounds like the corn maze we took our youth to, and us leaders got lost!!!! We had questions too and we still got lost!!! It was alot of fun thought!!! YAH sounds like a lot of fun - roaming around a corn field getting your allergies all riled up, a runny nose, sneezing AND getting lost at the same time. Yep sounds like a lot of fun. I'm just glad you found your way out! 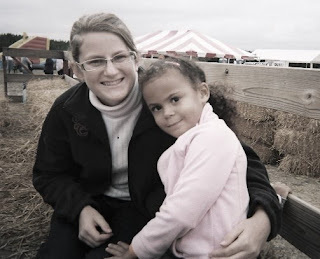 Val you have trouble in huge open parking lots what in the world made you think you could do a corn maze? And water!! Take LOTS of water!! 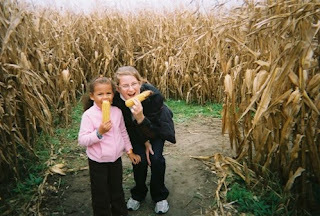 We did a corn maize last year with our S.S. class,it was a lot o fun. We didnt get lost tho because I WASNT the leader. It does make a person hungry tho, just starin down all that corn. U girls look really cute in there!! !